The vigilant resident reported suspicious symptoms to the citrus canker hotline and the detection has been confirmed by the department. A restricted area, which includes movement restrictions for host plants and materials, now surrounds the affected Nakara site with the aim of preventing further spread (a map of the Nakara restricted area and details of movement restrictions can be found on the citrus canker webpage). Residents living in the Nakara restricted area will be contacted directly regarding restrictions. Response teams will work hand-in-hand with members of the community to arrange inspection and removal of host plants. Northern Territory Chief Plant Health Officer, Dr Anne Walters, praised the community for its cooperation and assistance in the eradication effort. “Reports from the community are the best weapon we have in the fight against citrus canker,” Dr Walters said. The Nakara restricted area encompasses Charles Darwin University’s Casuarina campus. Emergency response teams will work closely with the university and residents to identify host plants. Citrus canker is not harmful to humans or animals but affects the quality and quantity of fruit produced. Strong winds and rain can carry the disease and Dr Walters asked Territorians for their continued cooperation as the wet season gets underway. “Residents who identify suspicious symptoms are asked not to move or destroy plants but to contact the citrus canker hotline as soon as possible,” she said. The Citrus Canker Hotline is operating 24 hours a day and can be contacted on 1800 931 722. Further information on citrus canker, including signs and symptoms, is available at www.nt.gov.au/citruscanker. 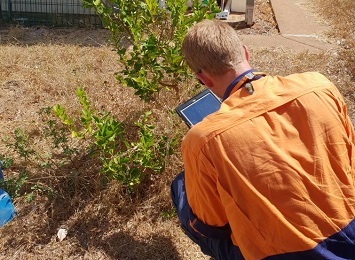 A citrus canker authorised surveillance officer checks a plant on a residential property.